The NUUO TP-4160R is a network IP video recorder that uses an embedded Linux operating system. 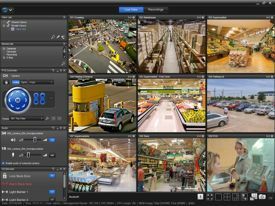 The Titan Pro TP-4160R is designed for higher end video surveillance applications which require a lot of bandwidth throughput for multiple megapixel IP cameras. The max throughput of the NUUO Titan is 250 Mbps which allows can support up to 64 5-Megapixel cameras at up to 15 frames per second with moderate activity. The TP-4160R is enclosed in a 1U rack-mount case. The NVR Titan has 4 hard drive bays that support up to 6TB SATA III hard drives. RAID 0, 1, 5, and 10 disk configurations are supported by the operating system.